Do you wish you could practice your golf game from the privacy and comfort of your own home? You can. 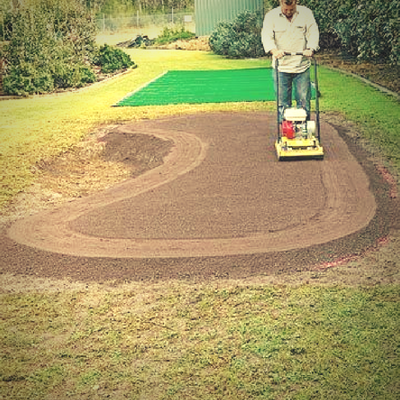 Installing a backyard putting green offers homeowners and avid golf fans an ideal opportunity to both enhance the beauty of their property landscapes and potentially lower their handicap. Go into the design process armed with these tips on how to make a putting green in your backyard a reality. Many homeowners select a synthetic turf kit product for their backyard putting green. Synthetic turf kits deliver minimal maintenance and upkeep beyond some occasional leaf blowing, enabling you to spend more time practicing and less time mowing and trimming. Choose the location of your putting green wisely. Even if you use synthetic turf, look for an open spot on your property that receives sufficient sunlight and plenty of ventilation to keep the area surrounding your design healthy. Additionally, find an area without any low spots to ensure your layout will sufficiently drain moisture and precipitation. Use a garden hose, rope, or cable to carefully measure your installation space and outline the perimeter of the green. Once you're satisfied with your layout, lift your measuring material and spray paint the final design directly on the grass underneath. Cut and trim the grass in your designated green area down to the dirt. After you've removed the lawn, rake over the spot to eliminate any additional soil clumps, twigs, branches, and debris. Next, add or eliminate dirt as needed to develop the curves and contours you need to sharpen your putting game. Creating hills and dips that roll in a specific direction can help you focus on where you need the most practice. Cover your newly dug and contoured yard space with landscape fabric, securing it to the soil beneath with landscape fabric staples. Next, begin placing rubber panels from your turf kit over the material. Once you've pressed the pieces together, hold each sheet in place using included fasteners. You'll also want to track exactly where you've installed the boards that have putting cups on them. Next, use a jigsaw to cut away excess. Finally, dig a 4-inch wide by 4-inch deep trench around the panel edges. You're officially ready to unroll your synthetic turf over your secured pieces. Once it's unfurled, cut the sheath so it's 4 inches larger than the panels around the entire perimeter. Keep that utility knife handy – you'll need it again after you install the actual cups into the boards to cut the turf around the turf holes. You're almost finished! Now's the time to fold back the turf edge and secure it to the underneath panels using double-sided tape. Next, use fabric spikes to secure the turf to the ground. Once the turf is locked in, you can fill in your trench and sweep off your green to remove any lingering debris. Voila! 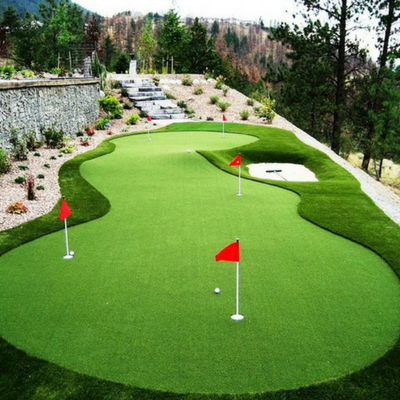 You've officially just installed your own personal putting green in your backyard. Need a green lawn to go perfectly with your new putting green? Contact Naturally Green for a beautiful Connecticut lawn today.